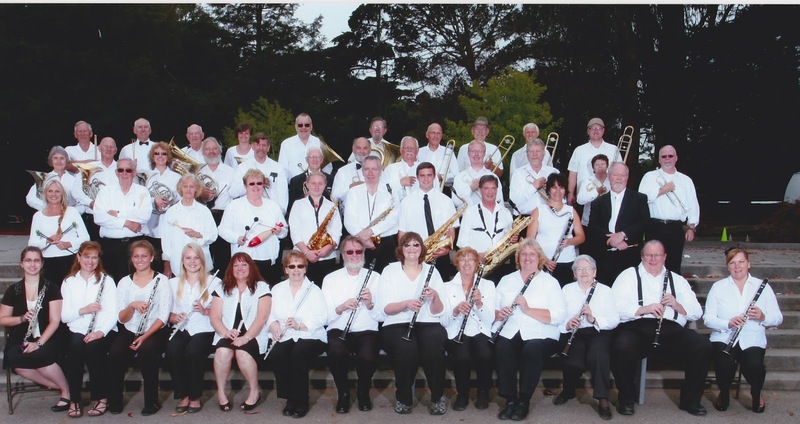 A free concert will be presented by the 45-member Amador County Concert Band under the direction of Steve Chambers and Irv Gidding on Sunday, October 11 at 3pm. The program will be held at the Community Church of Pine Grove, 14045 Ponderosa Way, Pine Grove. Featured music will be a medley from “Bond, James Bond”, transcribed for concert band by Stephen Bulla. This arrangement features the themes from some of the best 007 movies. Another special medley called “House of Horrors” features familiar themes from many of the old scary movies and cartoons we grew up watching! An arrangement called “Rocky and Bullwinkle Strikes Again” has melodies from the cartoon series that are a joy to listen to. Saxophonist Robert Bourke will be featured on a John Krance arrangement of “Harlem Nocturne”. Irv Gidding will conduct the theme from the movie The Alamo called “The Green Leaves of Summer”. Add a couple marches to the mix and we have a very fun afternoon of musical selections to come listen to! The band also was chosen to perform last year at the Golden Gate Park Band Festival in June and played under the recently restored historic band shell. The Amador County Concert Band represented the Northern California area and was one of the largest ensembles to perform over the weekend, receiving superb reviews and a special recognition award for its performance. The band was also invited to perform at Carmichael Park on June 7 at 2pm and performed well! Join us on October 11th at 3pm for an enjoyable musical experience; bring the family and enjoy the spirited music! Arrive a few minutes early for best seating….ample parking…music begins promptly at 3pm. Visit the band’s website at www.accband.org for additional information or to find out how to join the band. They made us wait but here's the surprise - special guest with the Flatlanders, accordion virtuoso Joel Guzman. We added a video of him below. He is a Grammy winner and gifted accordionist, songwriter, and vocalist. New write up on the Flatlanders too! HEART & SOUL (42 Main St in the theatre building) is on vacation until Thursday Oct 1, so tickets not available there until then, but are available here! RED MOON ROAD CONCERT MOVED TO FRIDAY NOVEMBER 6, 8:00 PM!! JUST ADDED - HEARTLESS - Northern CA premiere Heart tribute band, Saturday, Nov 21, 8:00 pm! ICONIC ALT COUNTRY SUPERGROUP - The Flatlanders featuring Joe Ely, Jimmie Dale Gilmore & Butch Hancock - with legendary accordionist Joel Guzman! Their last exclusive appearance was more than 6 years ago, so this is a very rare opportunity to see a classic band. NOW WE CAN TELL YOU - Special guest Joel Guzman, Grammy winning accordion virtuoso will be joining the Flatlanders for this show! SO WE WILL HAVE 2 GRAMMY WINNERS AND 1 GRAMMY NOMINEE ON STAGE FOR THIS SHOW! Joe Ely formed the Flatlanders with Butch Hancock and Jimmie Dale Gilmore in 1970 and released his solo debut LP in 1977. Since that time he has collaborated with the likes of Bruce Springsteen, Linda Ronstadt and the Clash (he sings backup on the group's 1982 hit "Should I Stay or Should I Go"), and has earned a Grammy, a CMA award and the Americana Music Association Lifetime Achievement Award for Performance. Ely's songs have been covered by numerous artists. He has just been formally appointed the Official Texas State Musician for 2016, recognized for his outstanding commitment to the arts in his home state. 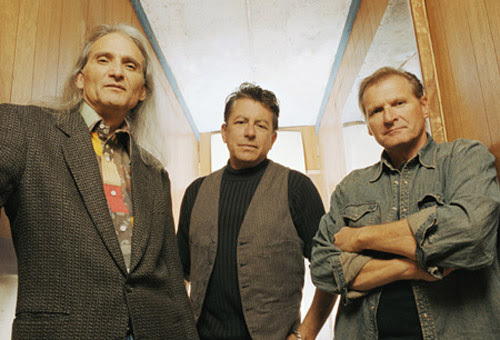 Grammy nominee Jimmie Dale Gilmore's high, lonesome drawl has always been one of the purest instruments in country music. And yet Gilmore's clearest antecedents are rock musicians - he's a missing link between Roy Orbison and Buddy Holly, a high-plains drifter evoking a primal sense of wonder that can seem almost childlike. Jimmie Dale Gilmore has been a central figure in both Lubbock and Austin music scenes for much of the last thirty years. Buddy Holly's father produced Gilmore's first record. As a "Hub City Mover" Jimmie was a featured performer at the Grand Opening of Austin's legendary hippie haven - The Armadillo World Headquarters. He was named "Country Performer of the Year" by Rolling Stone magazine three (3) times in the decade of the 90's. Today - reunited with his freinds Joe Ely & Butch Hancock for the 21st Century - this Flatlander is still touching souls with his mystical West Texas voice. Rolling Stone magazine describes Butch Hancock as "a raspy-voiced West Texas mystic with an equal affinity for romantic border balladry and Zen paradox." A world traveling troubadour with a long string of recorded songs and albums, Butch has been called "one of the finest songwriters of our time" and is acknowledged by his peers and critics alike as one of the premiere singer-songwriters Texas has ever produced. His tunes evoke mystical visions of wind-swept dry-plains and his lyrics are profoundly imaginative, often displaying for his listeners the miracles that occur in the ordinary through creative irony and metaphors. His lyrical style has often been compared to that of Bob Dylan and Woody Guthrie and his record Own and Own, released in '91, contains his "If I Were a Bluebird" a song later covered by Emmylou Harris. Grammy winner Joel Guzman is a gifted accordion player, songwriter, and vocalist. Joel Guzman at an accordion jam - fuzzy pic but clear sound! Michelle Whited performs a stunning presentation of reproducing Karen's unique voice along with Don Stamey on piano. The entire live band consists of skilled musicians who perform flawlessly, assisted by only pre-recorded background harmonies to attain the exclusive sound the Carpenters originally presented. 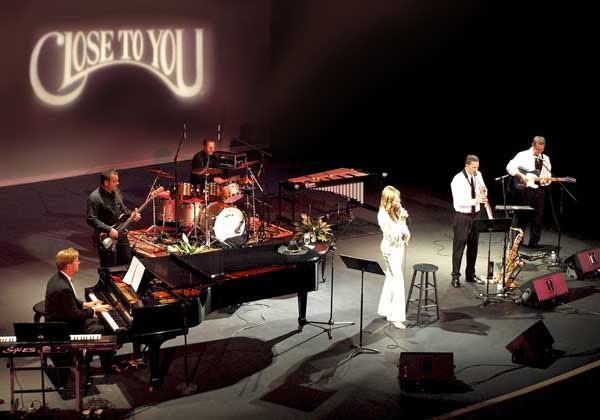 The result is a memorable show that will keep you enthralled as you revisit the remarkable music interlude from an era we cherish for a lifetime. The popular singing duo of the 1970's and early 80's focused on mid tempo pop and ballads with Karen Carpenter's unique and expressive alto voice on lead vocals. Both Karen and Richard Carpenter contributed background voices which were overdubbed to create densely layered harmonies, an integral part of their signature sound. TICKETS AND CLIPS FOR SHOWS ARE AVAILABLE NOW AT THE WEB SITE! 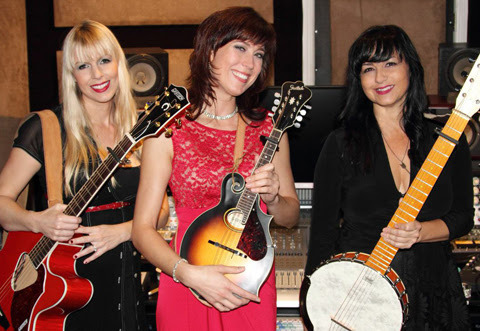 MOVED TO FRIDAY NOV 6, 8:00 PM - Red Moon Road - Canadian Roots and Alt Country - Back by popular demand! Sat Nov 7, 8:00 pm - RITA HOSKING - Authentic American folk - one of our favorite Northern Califronia artists - Rita returns for a new CD release Concert! Sat Nov 21 - HEARTLESS - Northern California's premier Heart tribute band! Sat Nov 28, 8:00 pm - Lacy J Dalton - Country's Queen - Kick off your Christmas season with Lacy and Dale Poune! Sat Dec 5 Winterdance presented by Molly's Revenge - Celtic Christmas show with Celtic dancers! Sat Dec 12 - Black Irish Band - America's only Irish Italian band, Americana, sea shanties, railroad music, Irish and Italian classic folk songs and more. Sat Dec 19 Sourdough Slim's Wild and Woolly Revue - our traditional last show of the year, Vintage cowboy songs, yodelling, comedy, Western music, with Faux Ren Wah, The Saddle Pals and Robert Armstrong. Where else can you get vintage cowboy songs on accordian and musical saw? Sat January 16- DOUBLE BILL - Houston Jones with Suzie Glaze & the HiLonesome Band - High Octane Americana and Newgrass/Americana/folk fusion. Friday - Feb 5 - Frank Vignola and Vinny Raniolo - stunning Jazz guitarist plays a wide range of music, entertaining and enthralling - back by popular demand! Join us as we welcome Gill to the Provisions stage!! For a meat and potatoes opening to his bio, Gill Landry is a singer-songwriter and multi-instrumentalist from Louisiana. But he's also a photographer, a traveler, a painter, a storyteller, a mechanic, etc… It would take a novel to tell his tale. From hustling the streets of Paris to hitchhiking America on day labor and daydreams, he's slept beneath bridges with his brothers and in the beds of lordy estates. He began his music career busking on the streets of New Orleans, cutting his teeth through the ranks, interpreting life from the curb up. He released his first solo album "The Ballad of Lawless Soirez" in 2007 on the Nettwerk label and has been performing as a member of the band Old Crow Medicine Show since 2005. He's opened legitimately and as a stowaway for a number of tours for such act's as Mumford and Sons, Brandi Carlile, Ben Howard, The Felice Brothers, and many more. 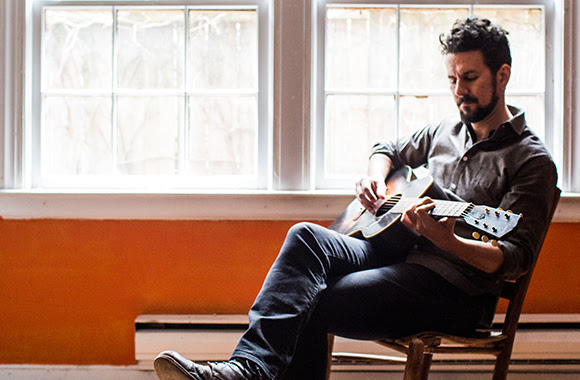 His latest body of work, the self-titled album "Gill Landry", was released by ATO Records in early March 2015. The album features a brilliantly diverse, yet cohesive, body of songs and a diverse cast of characters as well. From the haunting duet with Laura Marling in "Take This Body" to the Tex-Mex country guitar sounds of Robert Ellis in "Fennario", the songs are timeless, yet modern. His keen sense for lyricism is highlighted beautifully by the tonality and melody of the compositions. ALSO helping us celebrate REVIVAL TINTYPE! Come and have your authentic tintype taken just like your great-great-great granddaddy would have! Tangible. Honest. Permanent. Handcrafted portraits like your great, great grandfather took. Vintage keepsakes for the digital age.